All reports are set to a frequency of Monthly, with the exception of the Rank Progress Weekly Overview report. When you first open the White Label PDF Templates screen the list of Custom Templates that you have previously created displays. Custom Templates are those that you created from an existing PDF report by clicking the Save Layout button (refer to the Create a PDF Report Template section of the White Label Automated Email PDF Reports documentation). 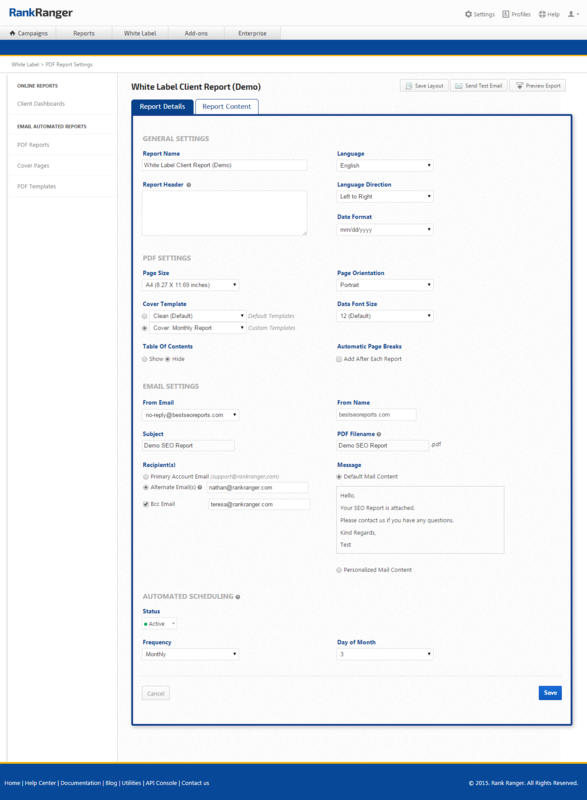 System templates have been created based on our experience of the types of reports that many customers use. Access them by clicking the System Templates button. All reports are set to a frequency of Monthly, with the exception of the Rank Progress Weekly Overview report. Download a sample of the Weekly Rank Progress report. Download a sample of the Monthly Rank Progress report. Download a sample of the Rank & Traffic Overview report. Download a sample of the Rank & Traffic Comprehensive report. 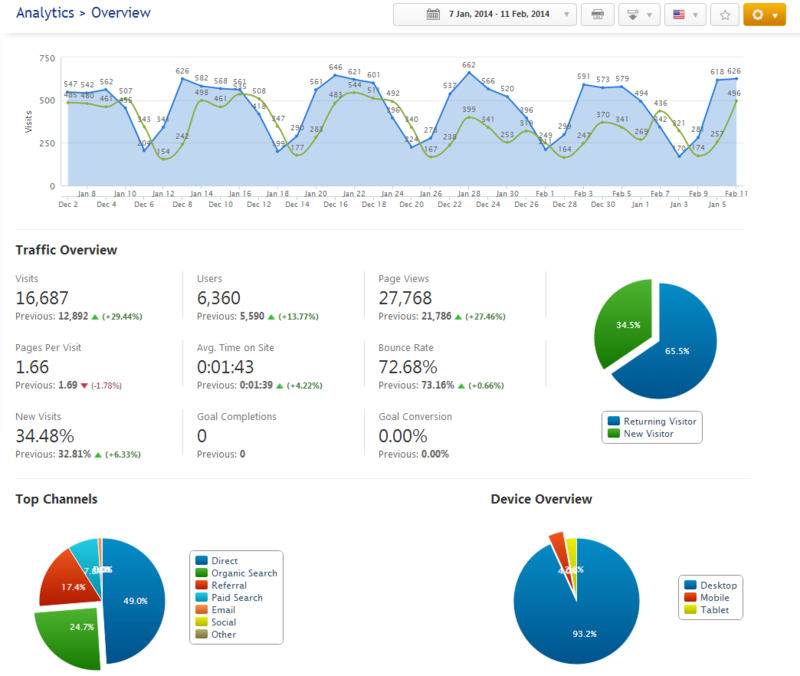 Download a sample of the Rank, Social & Traffic Overview report. Download a sample of the Rank, Social & Traffic Comprehensive report. The template is set to display Sessions as the Key metric with Conversion is set to All Goals. Settings can be changed by clicking Edit in the PDF report settings for this sub-report. Download a sample of the Traffic & Marketing KPIs report. Download a sample of the Traffic Demographics Comprehensive report. 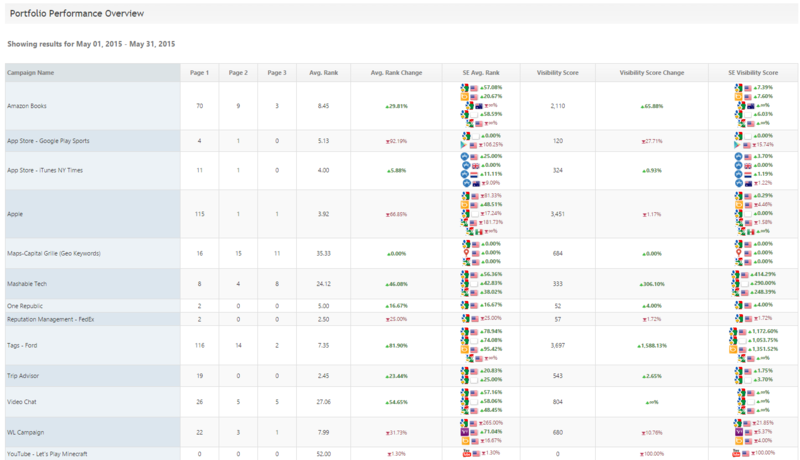 This is the default view of the Portfolio Rank & Traffic Overview, you may click Edit and Show/Hide Campaign details, Page Rankings, Average Rankings, Visibility Score, Google Analytics and Webmaster Tools baseline, current and change columns. You can also customize this report to include only specific campaigns, for example, if you have 1 client with multiple campaigns you can set this report to show only their campaigns. Download a sample of the Enterprise Portfolio, Brand Visibility, Rank & Traffic report. 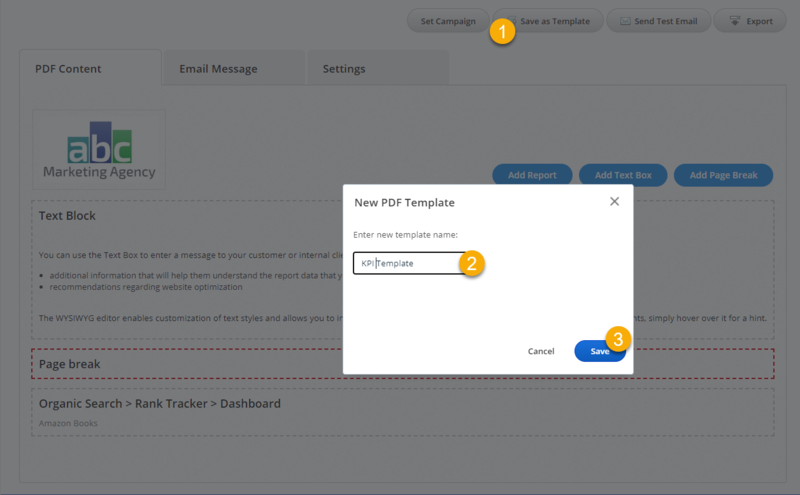 The default settings include Google Analytics Visits, if the campaign is not integrated with GA (as in the example below), you will need to Edit the report settings in the PDF Report Details screen. Download a sample of the Enterprise Portfolio, Brand Visibility & Rankings report. Download a sample of the Enterprise Portfolio & Brand Visibility report. Download a sample of the Enterprise Brand Visibility, Rank & Traffic report. Click the Edit button for each sub-report and select the campaign. This must be repeated for each sub-report because it is common for users to build a report using multiple campaigns (e.g., a campaign focused on organic vs. paid, or maps). Review and make any necessary changes to the Report Details screen, e.g., report Title, Email Settings, Automated Scheduling, etc. Please refer to the Create New: PDF Report Details section of the White Label PDF Reports documentation for further instructions.